The Omni-Bounce creates a diffused bare bulb effect, giving even coverage across the entire frame, with lenses from 15mm to 200mm in the 35mm format. Flash with the Omni-Bounce installed and tilted to 45 degrees gives a nice soft wrap around of light with a soft shadow behind the subject. 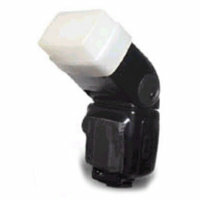 STO-FEN Bounce Products are designed to fit most of today's popular portable strobes. Custom fitting so you never have to use Velcro on your Strobe. Small and Compact enough to Fit easily into your pocket or gadget bag.